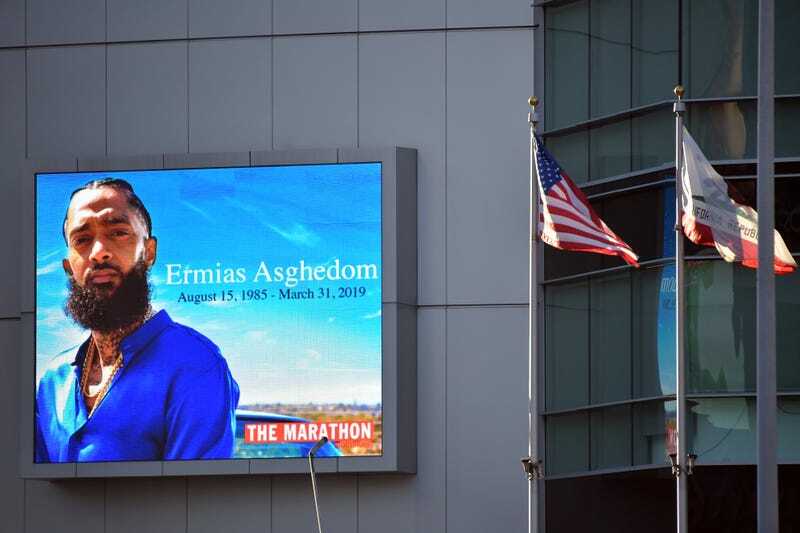 Signage of Nipsey Hussle is seen on the side of Los Angeles’ Staples Center prior to Hussle’s memorial service there on April 11, 2019. Tens of thousands of people packed Los Angeles’ 21,000-capacity Staples Center Thursday while many others stood outside and gathered throughout the city as fans, friends and family bid farewell to Nipsey Hussle at a public memorial. Billed as a “Celebration of Life,” the memorial brought people together from throughout Los Angeles and beyond. Scripture was read in Tigrinya, the language of Eritrea, the nation where Hussle’s father was born and in whose heritage Hussle took great pride. “He had such beautiful energy,” she said, the Associated Press reports. Various hip-hop luminaries were in attendance, including Snoop Dogg, Puff Daddy, Meek Mill, Pusha T, Big Sean and 2 Chainz. Tributes were also heard or shared from dignitaries including Nation of Islam leader Louis Farrakhan, who spoke at the service, and President Barack Obama, who sent a message that was read aloud at the memorial. Farrakhan called Hussle a “prophetic voice” of the community where he grew up and, later, grew businesses—businesses like the Marathon Clothing store in front of which a gunman took Hussle’s life March 31. Attendees at Nipsey Hussle’s memorial service hold up copies of the Nation of Islam’s Final Call newspaper with Hussle on the cover April 11, 2019. In a book of remembrances handed out to attendees, the AP reports, there were numerous photos of Hussle with London, his children, and friends like Russell Westbrook and Snoop Dogg. It also had heartfelt messages from people like the Game, LeBron James and Issa Rae. “I’ve never cried myself to sleep over any public figure before, but Nipsey’s presence meant so much for our community,” Rae said in her message, the Associated Press reports. And then there were the fans, some of whom traveled for hours to get to the service. A fan at Nipsey Hussle memorial April 11, 2019.